The present club was founded in 1992 from the amalgamation of two established Hellenic League clubs - Swindon Athletic and Supermarine. At the time of the merger fortunes were not running well for both clubs. 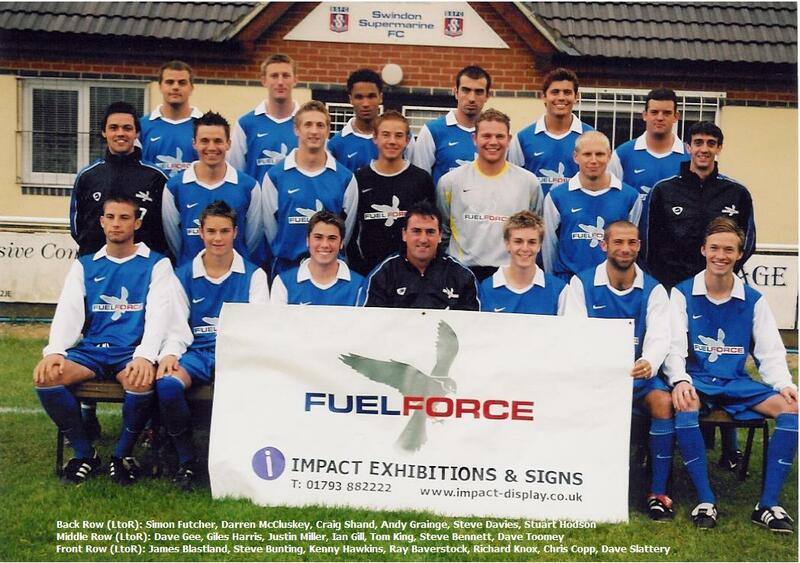 Supermarine were to finish in bottom place in Division One in the 1991/92 season and Swindon Athletic were having problems improving their facilities at their Swindon Borough Council owed Southbrook Recreation ground, and to comply with the then new league rules both clubs recognised that they could best achieve their ambitions by a merger and the new club, Swindon Supermarine Football Club took the place of Swindon Athletic in the Premier Division. Until the 1989 season Swindon Athletic were formerly known as Penhill. They were formed in 1968 and were previously members of the Wiltshire County League, winning the Wiltshire Junior Cup in 1976/77 and the Wiltshire Senior Division Two title the following season. The 1980’s saw unparalleled success for the club. 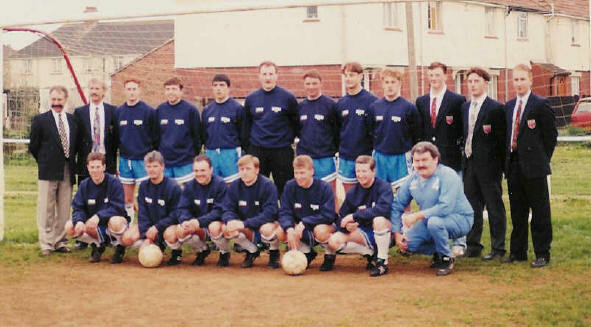 They were winners of the Wiltshire Senior Cup three times and runners-up twice between 1982 and 1989, and they were also promoted to Wiltshire Senior Division One League, where they won the title in successive seasons in 1982/83 and 1983/84. In 1985 they were promoted to the Hellenic League and were won promotion to the Premier Division at the first attempt when they finished runners-up to Viking Sports. The Supermarine aircraft company became famous in the Second World War for the part it played in building the Supermarine Spitfire airplane, which was designed by Reginald ‘Mitch’ Mitchell and for which we have all been eternally grateful. The football club grew out of the Works Social Club in 1946 under the name of Vickers Armstrong, and then simply Vickers. The club progressed through the Swindon & District and Wiltshire Leagues before joining the Hellenic League in the early 1980’s. 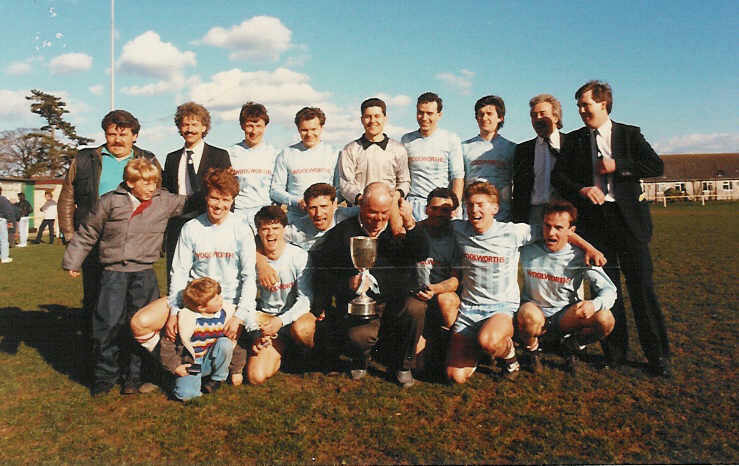 The club had immediate success in the Hellenic Division One League when they won promotion in the 1982/1983 season as runners-up to Rayners Lane on goal difference. They also won the Wiltshire Senior Cup in 1985/86 when they defeated Penhill 1-0, the club they were to merge with some seven years later. Supermarine also won the Dr. Elliott Cup on no less than five occasions during the 80’s. After the merger Swindon Supermarine regularly finished in the top eight in the Hellenic Premier Division. We were also Wiltshire Senior Cup finalists in the 1993/94 season and runners-up in the Hellenic Premier Division Cup to Cinderford Town in 1994/95. 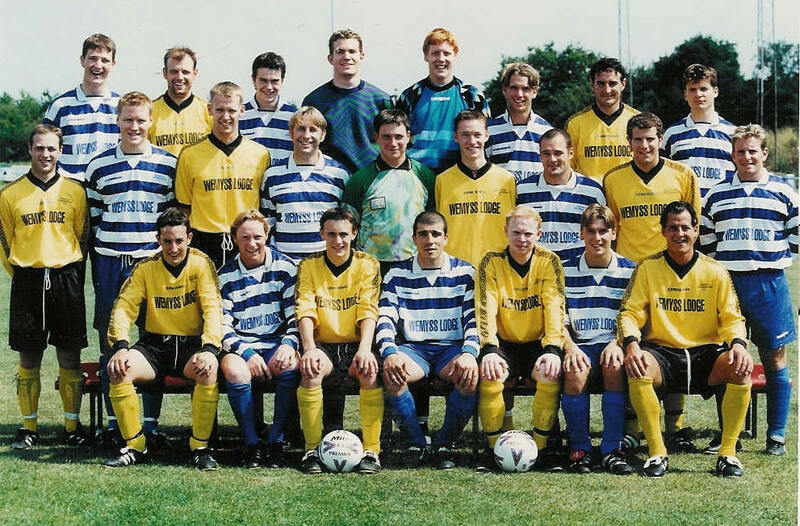 Also, in 1994/95 under managers Alan Dyton and Leo Colucci we entered the Wiltshire Premier Shield for the first time and went all the way to the final only to lose out to Trowbridge Town. With another Hellenic cup final defeat to Bicester Town in the Floodlight Cup in the 1995/96 season it seemed we could never get over that final hurdle. That all changed in the 1996/97 season when we won our first trophies since the club’s merger when we defeated Devizes Town in the final of the Wiltshire Premier Shield. With the Reserves securing the Reserve Division One Championship and winning the Reserve Division Challenge Cup a successful season for the club came to a close when we won the Hellenic Premier Division Challenge Cup with a victory over Kintbury Rangers. In the 1997/98 season we were at the top of the Hellenic Premier Division from September and had only Endsleigh challenging us for the League Championship come May. With the lead changing hands in the last few games it was up to us to win our last two fixtures to secure our first Hellenic Premier Division Championship. 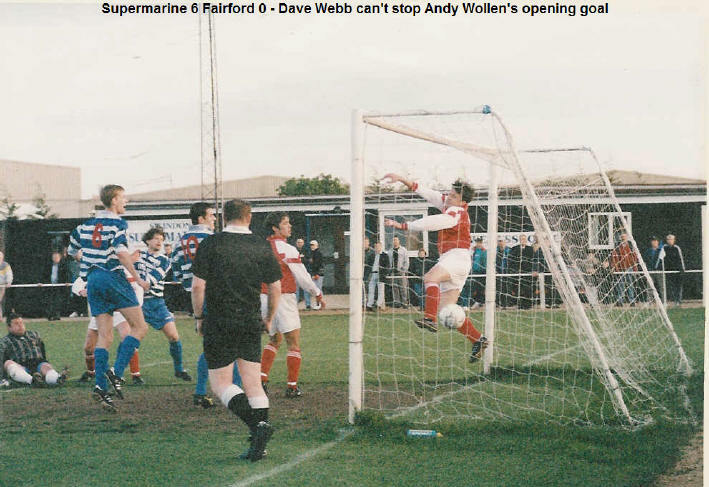 This was done in style with two emphatic home victories, 8-0 and 6-0 on consecutive days against Bicester Town and Fairford Town and we were duly crowned the 1997/98 Premier Division Champions under the guidance of John Fisher and former Swindon Town stalwart Don Rogers. There was no repeat of the previous seasons success in the following 1998/99 season. An early setback came with the loss of the successful management team of John Fisher and Don Rogers as both left the club in the pre-season. We kicked off the 1998/99 season with a new management team at the helm with former reserve team managers Dave Hawkins and Kevin Moloney. The season was going very well until November when a top three position gradually fell away after a dip in confidence and form. The team finished the season with only two league wins out of the last nineteen games and ended up in a disappointing fourteenth place. In January 1999 both Dave and Kevin left the club and from then on Alan Dyton took as manager. The only highlight that season came from an appearance in the Wiltshire Premier Shield final at the County Ground when we played against a strong Salisbury City side and lost 2-1. The following 1999/2000 season was a complete turn around with an excellent year both on and off the pitch. In November 1999 the club opened a new clubhouse at Hunts Copse and on the pitch we were very successful with two cup wins and a healthy third spot in the league. Only a dip in form in mid-March saw the team miss out on a runners-up spot. The team won the Norman Matthews Floodlight Cup with a 2-0 aggregate victory over league champions Banbury United in final. In the Cherry Red Records Challenge Cup final we defeated Ross Town 2-1 after extra-time at Didcot Town to win the trophy. 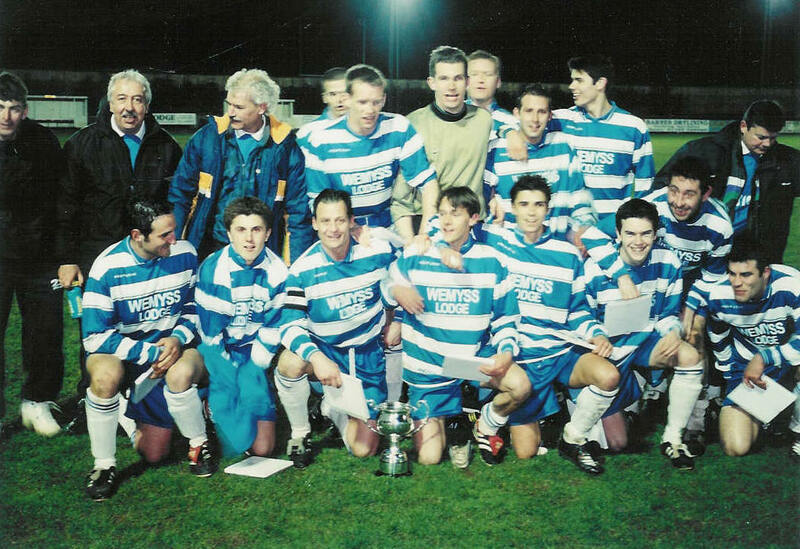 The success of 1999/2000 was improved on in the following 2000/01 season with a Hellenic League Premier Division championship title and the retention of the Floodlight Cup. The treble was on the cards but unfortunately Carterton Town defeated us 7-6 on penalties after a 2-2 draw in the final of the Challenge Cup at Fairford Town. With the championship secured the application to join the Southern League (sponsored by Dr Martens) was accepted. To secure promotion a number of ground improvements were successfully undertaken to meet the league’s guidelines. A 225-seater stand was put in place to compliment the old stand, taking the covered accommodation to 300 seats. A 6ft-perimeter fence was erected to enclose the ground, new toilet facilities for spectators were built and although not necessary to meet the league’s guidelines new floodlights were also put in place. Off the field the hard work continued with the Executive Committee working to secure the future of the club in the Southern League. Manager Alan Dyton informed the club of his decision to step down from his role because of work commitments but he was keen to continue in some capacity. In July 2001 Alan’s successor was found when the club appointed Swindon Town’s community officer Clive Maguire as first team manager and equally pleasing was that Alan decided to assist Clive that season. Unfortunately, Clive resigned his managerial post at the end of October and after acting as caretaker manager for three games Alan also left the club. Clive’s resignation came after a disastrous start to the season with twelve defeats from thirteen games. The Executive Committee then began the difficult task of looking for a new manager, a manager who could hopefully improve their perilous position in the league. After just ten days the club believed they had found the right man when they secured the services of the vastly experienced John Murphy. John had managed Cinderford Town, Witney Town, Trowbridge Town and Cheltenham Town and had achieved a number of successes in the Southern League. With John at the helm the team staged a tremendous come back in the League. Especially over the final two months of the season when we picked up a number of important victories. These victories left the team safe; a full ten points clear from relegation and a much healthy position than just after Christmas 2000. At that time we were bottom and eleven points adrift of the second from bottom placed team, with relegation looking like a certainty. A remarkable turn around in what was a truly remarkable season in the history of Swindon Supermarine. The team lived to fight another day in the Southern League and things could only get better from the 2001/02 season, or so we thought! The following 2002/03 season was unfortunately far worse than our first season in the Southern League. After a very good pre-season when the team played extremely well the season started disastrously with only one draw in the first seven league games, compounded by a disappointing 2-0 defeat at Chard Town in the FA Cup. By this time we were back at the foot of the league table and following further defeats John Murphy decided to relinquish his managerial position on Friday September 27th 2002. Over the following few days the Executive Committee drew up a shortlist of potential managers that they believed could turn things around. By Monday morning the September 30th 2002 they had decided to promote within and the club’s with Academy Director, Tom Jones, was offered the managers position, which he duly accepted. In the following nine games we suffered eight defeats, the last being a 9-0 demolition by Sutton Coldfield Town, and with only a single point from the draw at RC Warwick, Tom Jones resigned from his position as manager on October 12th 2002. After a weekend of hectic activity and a number of enquiries from interested managers the Executive Committee announced on the following Monday that former Cirencester manager Ray Baverstock had been offered and accepted the managerial position and the difficult task of saving the club from relegation. Along with his assistants Pat Slattery and John Freeth, Ray began the daunting task of keeping the club in the Southern League which they duly obliged with a record seven wins from the last eight league games culminating in a 3-1 victory at Bromsgrove Rovers on the last day of the season. During this run they also defeated Swindon Town in the semi-final of the Wiltshire Premier Shield only to lose 3-1 in the final to Salisbury City just 48hrs after securing our Southern League safety. The 2003/04 season started so differently from our first two seasons in the Southern League. With Ray and his team at the helm the team started very well with 18 points and a mid-table position by the end of October 2003. So it was a completed shock to everyone at the club when Ray decided to step down at this time due to personal commitments. With his assistants Pat and John also deciding not to carry on a new manager was needed to continue the brilliant work Ray and the team had achieved. After a number of interviews and no suitable successor to be found, chairman Steve Moore and major sponsor Rikki Hunt of Fuelforce began talks with Ray in an attempt to help resolve some of his personal commitments and concerns in an effort to offer him a route back as manger of the club. After three days of talks it was brilliant news for everyone when Ray decided to return to the club on a 2-year contract, just one week and one game after initially resigning. Unfortunately in January 2003 Ray informed the club once again he was quitting and he handed in his resignation for the second time in a season. It wasn’t long before Ray’s successor was found when Tommy Saunders’ footballing exile ended with the former Chippenham Town boss being unveiled as the man to take over at Swindon Supermarine. Saunders was at Hunts Copse to watch Marine draw 1-1 with Sutton Coldfield on Saturday 10th January and was formally appointed after the game. The outspoken 32-Saunders had led Chippenham from the Western League to the Southern Premier Division with back-to-back promotions and also took the Bluebirds to Wembley for the 2000 FA Vase final. Unfortunately, Saunders’ reign only lasted a couple of months as he resigned after the 2-2 draw with Cinderford at the beginning of March 2003. His Assistant, Mark Collier took over the job for the following game against Stourport Swifts and duly led the side to their first victory in seven games. Following that win Mark was offered the position as manager which he accepted and took us to safety with a 17th place finish in the Western Division and Southern League football for the 2004/05 season, our fourth in the Southern League. During the summer of 2005 the club managed to secure its future at South Marston with the purchase of the ground and an additional seven acres of land. A consortium of the club’s supporters led by former Swindon Town chairman Cliff Puffett, who was also the chairman of Swindon Supermarine at the time, bought the 9.5 acre site and formed the Land Committee that owned the land and facilities with plans to continually develop the facilities s with training facilities for the senior, ladies and junior players and the community of Swindon. For a fifth consecutive season we started the 2005/06 league campaign in the Southern League, with Mark Collier in his first full season as manager and Ian Howell as his assistant. With Mark and Ian at the helm the club had its most successful season to date with a fifth place finish and a place in the end of season play-off’s. Unfortunately we lost in the play-off’s to a strong Hemel Hempstead Town who went on to secure promotion to the Premier Division. During the summer of 2006 both Mark Collier and Ian Howell signed two year contracts to take them up to the end of the 2007/08 season. The 2006/07 season saw a number of changes in the constitution of the Southern League Division West, which was renamed the South West Division. With no less than thirteen new teams to face in the league and with our away travel slightly reduced in mileage from previous years it was an enjoyable season, made even better with an fantastic 2-0 play-off final win over Taunton Town to take us into the Southern League Premier Division for 2007/08 season. We were also successful in winning the Wiltshire Premier Shield with a 2-1 victory over Swindon Town in the final at Hunts Copse. During the summer of 2007 and before our biggest ever season in non-league football in the Southern League Premier Division we secured the services of coach Richard Smith but lost the services of a number of key players. But with some quality players secured by Mark Collier during the 2007/08 season we finished in a very creditable 12th place. We had something to build on for the following season as the management team and players gained valuable experience on what was was needed to survive in the Premier Division. The preseason of the 2008/09 season saw the club increase its membership with an U8’s, Ladies, Girls U16 and a Reserve teams affiliated to Swindon Supermarine FC and all playing at our Hunts Copse ground. The management team was also working hard to secure new faces and saying goodbye to one or two other players. Pre-season training started with coach Richard Smith leaving the club for Highworth Town, with Gary Horgan replacing him. Tom King, Cedric Abraham, Simon Heal, Richard Kear, David Stroud and Jason Welsh all left the club and the new players that signed for the start of the 2008/09 campaign included goalkeeper Matty Bulman (ex-Cirencester Town), strikers Alan Griffin (ex-Mangotsfield United) and Steve Cook (ex-Clevedon Town). With further signings during the season, including the return of Justyn McKay (ex-Bath City), we had an excellent season and were in the top six in January and had an excellent FA Trophy run. In the cup run we defeated Conference sides Eastbourne Borough and Bromley amongst others before losing to holders Ebbsfleet in the last sixteen. But due to the Trophy run and the bad weather in February we ended the season having to play three games a week in the last month or so and dropped out of contention for a play-off place and finished the campaign in mid-table. The 2009/10 season began with a 5-1 thumping of Rugby Town in the opening match at Hunts Copse but after that the team struggled for most of the season and it was only in March 2010 that they moved out of the relegation places with a run of good results. The team were knocked out of both the FA Cup and FA Trophy at the first hurdle, losing to Brackley Town and Fleet Town respectively. Without the finances from a cup victory or two, the loss of some main sponsorship and of course economic climate, financing the playing budget was a huge strain on the club and impossible to maintain so inevitably the playing budget was reduced before the end of the year. This decision led to only one player leaving the club for this reason. At the start of 2010 it was increasingly difficult to maintain the reduced budget but it was during these difficult times that the management and players pulled together and excelled in their commitment to the club. Playing the last few months of the season on the minimum of expenses which was highly commendable. They completed the most difficult in the clubs history in fifteenth position, seven points away from relegation. During the summer of 2010 the Executive Committee released a statement indicating that the team was likely to be disbanded and be disbanded from the Southern League due to a lack of funding. They informed manager Mark Collier that they couldn’t give him the necessary assurances to finance another season in the Southern League and appealed for the friends and supporters of the club to help with a survival plan. To continue playing in the Southern League a new Executive Committee was urgently required, with new members and an increase in numbers who would commit to finding the required finance. The old Executive Committee and a number of enthusiastic supporters met each week over a six week period then in the second week of June 2010 a new committee was formed to take the club into the new season and in the Southern League! A commitment to financing a playing budget was made by the new committee and Mark Collier accepted the position of continuing as club manager and began the task of recruiting a playing squad for the 2010/11 season. Although starting a little later than he would have liked he was delighted to report at the end of June 2010 that discussions had taken place with most of the players from last seasons squad and he had resigned a number of them for the start of the 2010/11 season. This was an excellent platform to start with and an example that demonstrates the commitment of the manager and players. Shortly afterward Mark announced two further signings, former player manager Tom Jones has returned to the club as Assistant Manager, replacing Richard Smith who had been forced to leave due to personal reasons and Denis Murphy has replaced Gerry McKay as the clubs Sports Therapist after he left due to work commitments next season. In August 2010 Mark Collier was confident he had a squad of players that could compete with the remaining twenty-one clubs and maintain a place in the Premier Division come May 2011. The 2010/11 season saw the club maintain it’s Southern League Premier Division status with a very creditable 10th place finish, especially with the resignation of Manager Mark Collier and his Assistant Tom Jones in February 2011. Experienced players Gary Horgan and Matt Robinson took over in a caretaker role and rallied the players to perform extremely well and finish the season on a high with three win’s in the last three games. There caretaker roles ended after the last match of the season, a pleasing and excellent 3-1 win over neighbours Chippenham Town. After there successful caretaker role the popular duo were offered and excepted the committee’s offer of becoming Joint Managers for the 2011/12 season. Besides the solid league performance in the 2010/11 season the team had an exceptional FA Cup run when they went further than ever before as they reached the Second Round and only lost 1-0 away to NPower League 1 side Colchester United. A memorable day for all connected to SSFC and it’s supporters. Highlight’s in the previous rounds include a remarkable 4-3 Fourth Qualifying Round win at Conference side Bath City with a 94th minute winner from Kyle Lapham after coming back from a 3-1 deficit. In the First Round we were drawn at home to Conference North side Eastwood Town and a large crowd witnessed another cup shock when we held out for a 2-1 win after storming into a 2-0 lead during the first half. The memory of the joyous scenes at the final whistle in both these cup ties will be remembered for a very long while. The 2011/12 season ended in disappointment for the whole club when the team were relegated from the Southern Premier Division to the Division One South & West after finishing in 22nd place, although only losing our position in the Premier Division for the 2012/13 season on goal difference. Joint Managers Gary Horgan and Matt Robinson, having moved from their caretaker roles of the remaining few months of the previous season, had a difficult season and but for a severe run of bad results in December and January the team were surely have survived. Survival wasn’t helped by the fact that they had to use seven different goalkeepers throughout the season for one reason or another. Shortly after the season ended and after long discussions with Gary and Matt the outcome was that a new manager would be appointed for the 2012/13 season in the South & West Division One. Within a mater of days Highworth Town manager Dave Webb was approached by the club committee with a view of taking over the managerial position at the Webb’s Wood Stadium. Dave Webb accepted the offer and along with his assistant at Highworth Lee Spalding, they were duly appointed Manager and Assistant Manager in May 2012 and quickly began the job of building a side ready and prepared for the tough season. The 2012/13 season was a very good one for the new management team as they led the team to a fourth place finish and secured a playoff position four games from the end of the season. That fourth place finish could easily have been second but for a last day defeat at home to Clevedon Town. Finishing in fourth place meant an away game in the playoffs and that was at Merthyr Town where the team gave an excellent account of themselves against strong opposition only to loose on penalties after conceding an equaliser in the 95th minute of normal time, a disappointing end to a fantastic 2012/13 season. The management team will now look to build on that success in 2013/14 which of course will be very challenging as the summer of 2013 saw a number of key players leave the club and Dave and Lee began a rebuilding programme. At the start of the 2013/14 season the management team of Dave Webb and Lee Spalding continued in there respective roles but having lost three key players to Hungerford Town in preseason, namely Ashley Edenborough, Chris Taylor and Josh Parsons the structure of the team needed rebuilding. They managed to do this with Edenborough returning to the club before the opening day and the signing of Swindon Town loanee Kayden Jackson who scored 12 goals in 14 starts to keep the club in a league position to challenge for a second consecutive playoff place before returning to Swindon. Edenborough was then rejoined by both Chris Taylor and Josh Parsons from Hungerford before the end of November 2013 and we were there or there abouts for a playoff place but it wasn’t secured until the last day of the season with a 5-3 win against Bishops Cleeve at the Webbswood and a fifth place finish. In the playoff semi-final we once again had to travel to Merthyr Town where we gave an excellent performance only to loose for a second successive season at the same stage and venue. Edenborough with 29 goals from 35 starts and Parsons with 25 goals from 27 starts were undoubtedly the reason behind another successful season. The 2014/15 season was a huge disappointment on the previous two seasons with a fourteenth place finish compared to a top five position achieved in the previous two seasons and a playoff loss against Merthyr on both occasions. The main reason behind our disappointing season was the large amount of injuries we had to key players and mainly defenders. A number were long term and a couple of them were still absent for the start of the 2015/16 season. A good run in the Red Insure Cup (Southern League Cup) saw us reach the quarter-finals where we lost 2-0 at home to North Leigh. In the FA Cup we won two earlier rounds against Hallen and AFC Totton before losing 3-0 at Conference South side Havant & Waterlooville in the Second Round Qualifying. In the FA Trophy we lost at home to Fleet Town by the odd goal in three in the Preliminary Round. The 2015/16 season saw a couple of wins in the FA Cup and FA Trophy that helped the clubs funds. The team finished the season in a playoff position and just as they did in 2012 and 2013 they unfortunately lost at the semi-final stage once more. On this occasion it came from a 2-1 defeat at Taunton Town but overall although a disappointing end the players did themselves proud and were unlucky to lose a game they dominated. The 2016/17 season saw a team shake up at the beginning with a number of experienced players being released and a group of youngsters set to make their mark on the team and the Southern League. The players worked hard all season and all but for a late slip we could have made the playoffs as the team finished in sixth place, just one position outside the playoffs. In the Cups we had a couple of games in each of the major competitions, the FA Cup and FA Trophy, but was successful in winning the Wiltshire Senior Cup, beating neighbours Highworth Town 2-1 in the final. In mid-January the following season, 2017/18, manager Dave Webb departed the club and his assistant, Lee Spalding, took on the role of Caretake Manager until the end of the season. Come the end of the season Lee and his team finished in fifth place and a playoff position with a semi-final at Evesham United. After drawing 1-1 after extra time Marine went through 5-4 on penalties and a playoff final at third placed Wimborne Town. In another tight game, which ended 0-0 after extra time, Marine won 4-3 on penalties and won promotion back to the Evo-Stik South Premier Division and what will be called the Premier Division South for the 2018/19 season.